Released in 1999, Digimon World tells about a young boy named Hiro drawn into the Digital World through his V-Pet device. Digimon around File City turned feral and it is up to Hiro to save them. 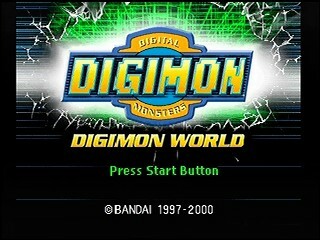 Train your Digimon and make friends as you battle throughout the Digimon World and save it from destruction. Best time: Single-segment 1:29:47 by 'Sparsie' on 2014-08-03. I began speedrunning this game almost exactly a year before completion of this run, it was also my introduction to actually speedrunning myself, rather than only watching other runners doing their attempts. The fastest known time when I started was a 1:52:01 by BlackWin5 with a, for it's time, reasonably optimized run. In a whole year of work on this game by several runners, going through countless numbers of route changes and improvements, the game is finally brought down to an hour and a half. The overall amount of resets it took me to get this run is 480, the major reset-point being about 30 minutes into the run, and I'm definitely glad to be able to say that all the work has paid off. I want to thank: Kakka_rot, BlackWin5, Azureflame4, Kyutora, Kheartz, Foxtreme, Jukebox_Hero and anyone else involved with Digimon World-speedrunning for getting me into running this game and doing their part in helping to develop (or rather, digivolve, heh) this run into what it is today. The version I was playing on was the NTSC-U version of the game, the fastest version for the any%-category. The console was a Playstation 2 with "Fast Disc Speed" enabled. I will now briefly go over the run, to highlight the most prevalent positive and negative aspects. For more in-depth analysis and explanation of the route, I would recommend you to check out my audio commentary. This section went alright. The main thing that can lose you time here is getting your Autopilots denied, which fortunately did not happen to me when trying to feed the first one. The Drimogemon fight was good, the only Megaton Punch that Drimogemon actually got off on Agumon was blocked, letting me conserve my healing items for the later parts of the run. The only setback was that i had to use my finisher to end the battle, since Agumon refused to dish out the last hit by himself. Here is the main reset-point of this run, and it went exceptionally well. Assuming it is used at least once in battle, SandYanmamon has a 14% chance to teach Birdramon the move "Spinning Shot", which is absolutely necessary to beat this game quickly. Not having it is an instant-reset. Learning the move I wanted, while at the same time getting the super-rare Protection drop from the Sandyanmamon, was pretty much the best possible outcome of that fight. The fights in this section were solid: Enemy Birdramon spamming Prominence Beam is alright, as long as I get my own hits in. I didn't get blocked once, which is great, considering the fact that the average amount of blocks you'll see in this fight is 2-3. Meramon didn't flatten me, though I barely missed the damage-rolls for a three-hit kill, which could have saved a few seconds. The "multi-Digimon"-battles in this game are a pain, due to constant interruptions, but the first Ogremon-duel in the Canyon was pretty fast. Most importantly, I did not get injured here, which can waste up to 40 extra seconds. Another multi-battle. Birdramon took out the two Agumon very quickly, to deal with Ogremon by himself. Faster than the average Ogre Fortress-battle. I landed both of the skips that this part of the run has to offer: Agumon-Skip and Goburimon-Skip, in total saving about 2:30 minutes over not getting them. Good movement in this section, although I was very happy with my movement over the course of the run anyways. Not getting a single unwanted encounter is a definite requirement for getting a good time in this game, and requires a decent chunk of practice. The third multi-battle of the run was a solid fight that left me without any unwanted, time-wasting status effects, which are usually very common here. Not much happening in this section aside from the Greymon-fight, which went well. Once again not getting status'd, which is unlikely but possible and has happened several times in previous runs. Unfortunately, I blacked out a little on the shopping menu and lost about 5 seconds there. Decent timing on the entry in Factorial Town, my impatience brought me extra loading-screens. The Giromon-fight in this section is the best place to use the additional Protection in, although getting status'd right at the start of the fight prevented me from getting the full benefit of it. Another interesting aspect of this fight was the DG Dimension-spam, which is a rather uncommon, but not unfavorable. Numemon went as well as expected, not being able to flatten my Birdramon and therefore not wasting my time. Biyomon is a dangerous run-killer, and as with a lot of aspects of speedrunning this game, there is not much I could have done to prevent a timeloss, had it decided to troll me. Fortunately enough, I not only got Biyomon in the first cycle, but also in the most favorable spot: On the eastern side to my character, which is what is what made this Biyomon close to perfect. Giving me Otamamon in the 2nd screen of Geko Swamp saved me an extra second, as the screen has a reduced loading time. Awkward Gabumon-fight, the RNG overall didn't seem to be favoring me in this part of the run. Getting placed in the wrong screen in Misty Trees twice was unlucky, and the Kokatorimon-fight had a few seconds of room for improvement as well. The tides are turning a little bit again, as the three fights leading up to Seadramon went very well. Seadramon itself put up a good fight before finally letting me catch him in a reasonable amount of time. Another good section of the run, very favorable Ogremon-battle, not locking me inside one of the Agumon and saving 6 seconds. I gambled in feeding the HP-Chip early, as my Birdramon's discipline was very high, and lost a few frames for it. In return, I got the "instant-feed" on the last two Autopilots of the run, which is a trade-off I will take any day. Final section of the run, and it went as well as you could want it to. The only real dent, that was put in the run here, was my interrupted finisher in the MetalGreymon-fight. Devimon was fairly nice to me, and the final Machinedramon was exceptionally good. Not having him start off with Thunder Justice, throwing my Protection without a status, getting of my finisher while at the same time interrupting his is exactly what you would want to happen in this fight. Bottom line: Yes, it wasn't the perfect run. Yes, there is room for improvement, especially in the RNG-heavier parts of the run. But overall, this is still the best run this game has seen so far, and I'm very much satisified with this. And honestly, after a year of running this, I am not to keen on beating this time, as a 86% chance on having your runs on good pace die 25 minutes in, gets old very quickly. Let me end this comment with a more positive attitude though: I got lots and lots of enjoyment out of developing this run, working on the route and competing with the other runners of this game. Once again, a huge thanks for getting me into running this and making speedrunning this game a very enjoyable experience.